(Black-Capped Chickadee (Poecile atricapillus) - 01) As we walked along the lake shoreline path we heard birds peacefully singing and chattering. Then we heard what sounded like the soft contented sounds we've heard people make when they are enjoying a good meal, but this sound was coming from a black-capped chickadee who was dining at what we believe to be the Douglas Fir Restaurant. (Black-Capped Chickadee (Poecile atricapillus) - 02) We were able to get quite close to this black-capped chickadee, and he or she almost seemed to be purring each time a tasty morsel was spotted. The sound was very soft and sounded like "um-um-um". If God has given this little black-capped chickadee the ability to enjoy its food, it should be obvious that He has given this and all other creatures the ability to enjoy many aspects of its life and the environment around us. This is their God given right. (Black-Capped Chickadee (Poecile atricapillus) - 03) If, as we believe, we have the right to enjoy life and pursue happiness, then all the other creatures who God created have the same right, even if we humans all too often deny them such rights. 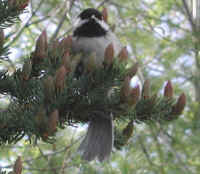 While watching this black-capped chickadee, such God given rights were abundantly evident. (Black-Capped Chickadee (Poecile atricapillus) - 04) This black-capped chickadee was going from one place to another sampling the tasty treats, as we humans often do at a buffet. (Black-Capped Chickadee (Poecile atricapillus) - 05) This acrobatic diner was really enjoying the meal that was set out upon this evergreen buffet. (Black-Capped Chickadee (Poecile atricapillus) - 06) It was obvious that this black-capped chickadee knew we were there, and yet there was no indication of fear. This was just another encounter that proved to us that Isaiah's Biblical prophecy of a peaceable kingdom is true (11:6-9). (Black-Capped Chickadee (Poecile atricapillus) - 07) As I kept moving around this tree to get in position to take another picture of this black-capped chickadee, it became a continual prayer of thanksgiving for the opportunity to be able to record this event. It was also a prayer of hope, that those who viewed and read this little photo journal would become more and more sensitive to our responsibility of preserving and protecting the whole of creation, whether humans, animals, or the environment. (Black-Capped Chickadee (Poecile atricapillus) - 08) Every time this black-capped chickadee bent over to pick a tasty morsel from the tree, we would hear the "um-um-um", which seems to be a universal expression of contentment. Perhaps it's even a form of grace and thanksgiving to God, as we say at our mealtimes; only this prayer was spoken in "chickadee". (Black-Capped Chickadee (Poecile atricapillus) - 09) There was great joy present when we were taking these pictures of this black-capped chickadee. And that joy was repeated many times over as we wrote and prepared this photo journal for publication. To deliberately want to harm this, or any other of God's creatures, is truly evil. (Black-Capped Chickadee (Poecile atricapillus) - 10) Every so often this black-capped chickadee would stop and rest before going back for another helping from the buffet. (Black-Capped Chickadee (Poecile atricapillus) - 11) This skyward-looking photo of the black-capped chickadee gives an interesting contrast of light and shadow. There is so much to enjoy in nature, and so much to lose by destroying it. (Black-Capped Chickadee (Poecile atricapillus) - 12) Meal time was almost over. so this black-capped chickadee decided to watch us as we were watching him or her. (Black-Capped Chickadee (Poecile atricapillus) - 13) And then, as we humans so often do as we leave a restaurant, taking a final nibble or picking up a piece of candy, this black-capped chickadee took one final tidbit and flew off until we meet again and enjoy each other's company. Such mutual enjoyment is never, or only selectively experienced, by people who kill and eat our fellow creatures.